The end of June is upon us and I have managed to get through Pride month with a minimal amount of stress and anxiety. In my city the official celebrations are not held until late August, but there is plenty of Pride around all the same. I have written before about my general sense of disconnect from the LGBTQ community, and the rejection and isolation I’ve experienced over the years. But to be honest, I look at Pride with some measure of envy. I wonder what it would feel like to be able to celebrate myself for who I am and not wish, after all these years, that my life had been different. There is, in many a queer life, an inability to negotiate the public and the private, the secret and the shared, in a fluid wholistic way. Sacrifice becomes an element of existence in the world. Time, place, and cultural considerations have long had an impact on queer lives lived. Set in Calcutta and California, Don’t Let Him Know by Sandip Roy is the kind of LGBTQ story that resonates with me, even if my own experience is very different. A queer life dominated by a need to hide and a failure to find release and connection the way one longs for is not simply a story of the past. This novel speaks to the choices we make in our attempts to salvage some normalcy when what we need or long for is denied or feared to be impossible—a reality that reaches beyond the constraints of culture or questions of sexuality or gender identity. This warm and richly woven tale examines the shifting dynamics within a traditional Bengali family as values slowly change in response to influences from inside and outside India. Roy, a writer and journalist from Calcutta, who lived in the US for twenty years before returning to his native city, draws on his own experiences growing up in a protected, comfortable family as well as the challenges and freedoms afforded by moving to America, in this multi-faceted exploration of the conflicts between identity, honesty, and obligation. Central to the story is Romola who, having agreed to a marriage negotiated by eager family members, finds herself in small town Illinois with Avinash Mitra, a quiet young man she hardly knows. When a letter from India arrives one day, the homesick bride tears it open without checking carefully and finds herself holding a letter from her husband’s lover who had hoped that they would be able to build a life for themselves in the US, away from the prohibitions of Indian society. This man, Sumit, wonders why Avinash did not wait. Romola, unable to begin to process the information, tucks the letter away. She does not confront her husband. His secret remains with him, her awareness of his secret remains with her. Years later, after his father’s death, their son, Amit, finds the second page of the letter and assumes he has uncovered a piece of his mother’s hidden past. Secrets multiply. Moving back and forth in time, this novel traces the childhood and youth of both Avinash and Romola, their years together as a family back in Calcutta where they raise their child in a multi-generational household, and Amit’s eventual settlement in San Francisco where he marries an American woman and becomes a father himself. A fine example of classic, emotionally balanced storytelling, each chapter adds to a network of secrets, large and small, creating a rich and bittersweet tapestry. Roy resists the temptation to break open the fragile restraints that bind his main characters, and although not entirely without hope, there is a deep sadness at the heart of Don’t Let Him Know. For Romola this is often expressed in a degree of repressed bitterness, making her, at times, less than likeable. Avinash, by contrast, withdraws. He often appears to fade into the sidelines, something that anyone who has lived for a significant amount of time closeted or otherwise invisible will recognize. His first attempt, later in life, to connect with other gay men finds him awkwardly out of synch and results in an episode that is by turns humiliating, exciting, and potentially dangerous. As a reader, I longed to know him more, yet I admire Roy’s decision to tell this story, this way. Many LGBTQ people exist in spaces defined by loss and longing. 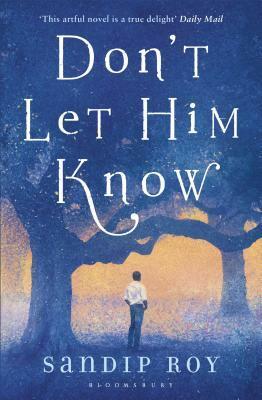 Don’t Let Him Know by Sandip Roy is published by Bloomsbury.